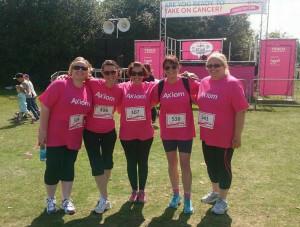 On Sunday 7th June 2015, Axiom GB sponsored a team of five women who took part in Cancer Research’s race for life. Held at Sutton Coldfield, the course took a scenic route through the very popular Sutton Park which has a mixture of terrain including woodland paths and grassed areas. With both flat and hilly areas on the course, the girls finished the day in good spirits, enjoying the sunshine. Axiom GB donated £500, helping Zoe, Becky, Vanessa, Sarah and Alison reach a fundraising total of £1000. Zoe’s husband works at Axiom GB but all the girls in the team have been affected by cancer in some way, so it was a poignant event for them. The money will go towards funding life-saving research.